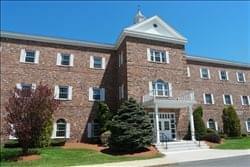 Find My Workspace lists over 95% of the executive office suites market in North Andover. Simply click Request Quote to check pricing for one office, or Add to Basket for multiple offices. This space offers a variety of office solutions for your business needs. The offices range from 100 square feet -perfect for a single occupant- to 260 square feet -Team Offices or Executive Suites. Enjoy free and convenient parking, free secure Wi-Fi, business lunge and cafe area, phone answering, receptionist services and 24/7 key card access. The membership plans are flexible and allow entrepreneurs, professionals, and small business owners the amenities of a fully-serviced office without the high costs and long-term commitments required by standard office leases. This center also offers a month-to-month or a long term membership plans for your convenience.